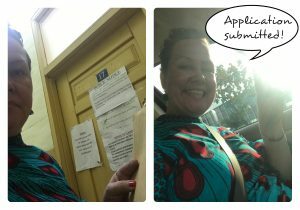 After an initial application, payment to MINT, or Step 1 of the Ghanaian Citizenship process I covered in an earlier post, you get called to submit additional, but mostly overlapping documents to the Ghana Immigration Service located just behind MINT. In my case, the processing took just three weeks, but as I was called only once and not mailed, I only went back to check on my application months later, so here you need to be proactive. A police report which cost 120 GHS. You need a passport picture and your residence permit. The process takes a week. Getting a tax clearance certificate can take long, so start in time. If you are employed, it is your employer who applies for you. As the government last week rolled out the National ID card, getting the Non-Citizen ID card has been impossible, but I was allowed to submit my paperwork without the non-citizen ID card (which ironically I have never needed to use before since its inception in 2014). Next, I will be visited by an immigration officer in my house with my husband to make sure we are truly married and cohabiting. After that we might be called for an interview to clarify if the visit was not satisfactorily. Citizenship applications are approved in batches and I was told I just missed one, so waiting for the next. So far the process has taken me almost a year since I started thinking about it and gathering the documents and since the beginning of June, since I originally submitted my application, that is effectively six months and about five visits to MINT/GIS . Wishing you luck with becoming a Ghanaian citizen! I lived in Ghana twice, for a combined 9 years, and one of our children was born in Accra. Of all the countries I have lived in (7 or 8) Ghana is my favorite — because of the people!